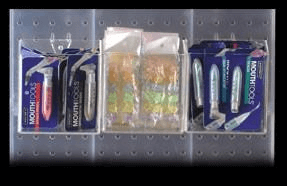 Acrylic bins are the perfect addition to your slatwall display. Clear acrylic slatwall containers will showcase products with extra flair. Use this acrylic hanging cube on slatwall and pegboard or as a counter display. The slatwall hook is attached to the bin. 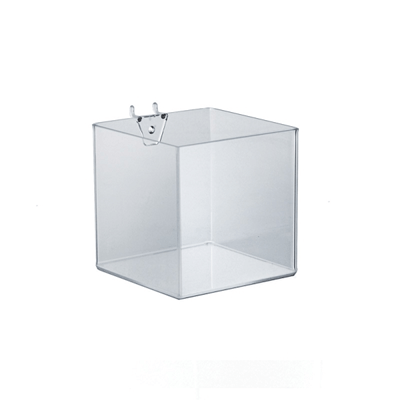 This cube shaped bucket displays any type of product in an attractive and convenient way. Display everything from candy to small cosmetics and everything in between. No matter what you fill these acrylic display cubes with customers are sure to stop and check it out. What are you waiting for? Get them today at All Candy Containers. Acrylic Slatwall Bin - 6" x 11 1/2"